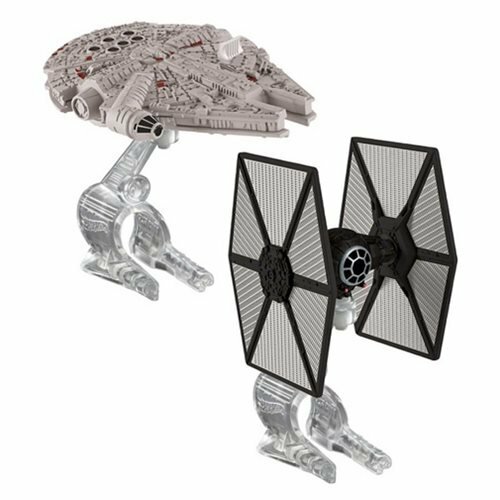 Launch into hyperdrive with the Star Wars Hot Wheels Force Awakens First Order TIE Fighter vs. Millennium Vehicle 2-Pack. Kids will love re-creating some of the galaxy's most epic battles and fiercest showdowns with these detailed Force Awakens TIE Fighter and Millennium Falcon die-cast starships. Using the Flight Navigator, it's easy to pilot your ship through the air - just like in hyperspace! The Flight Navigator also doubles as a display stand and is ideal for showing off a collection.